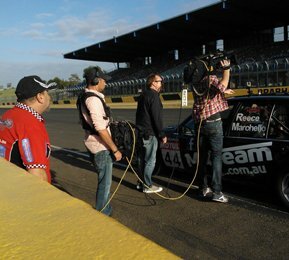 On Friday 23 November MRTeam Accompanied the Today - Weather Segment at Sydney Motorsport Park for the 'Celebrating Motor Racing History - TASMAN REVIVAL'. Our intentions were to just have the cars in front of the camera with Steve Jacobs talking about the cars and their connection to the event. Luckily for us we were also able to take the cars out on the track. It was a strange but amazing feeling being the only two cars on the circuit before 7.00 am. The Production crew set the cars up with cameras to do a live feed back to the studio. Steve was his usual funny and enthusiastic self. He very excitedly showed off our cars to thousands of regular viewers whilst giving a brief run down on the history and power of the VB Commodore. Overall it was a very positive experience. It was great exposure for ourselves and our sponsors as the Today Show is very popular and covers a wide audience. We are very grateful for the opportunity and look forward to future appearances with Today. This allows us to upgrade our Provisional Circuit license to a National Circuit license. MRTeam would like to thank John McCabe our truck driver, Simon Chapman from Ulladulla Motors and Heidi Yi from Heidi Yi Mineral Cosmetics for their help and support on the day. As always this was greatly appreciated.